People are starting to eat more salads. Because of this, they want their vegetables to be clean and healthy to eat This means that they will need a salad spinner. The Cooking Detective took the time to do the research and decided that the OXO Good Grips Spinner is the best salad spinner for your healthy eating. This little gem is easy to use and handy around the kitchen. But, there are also a few others that we looked at as well. 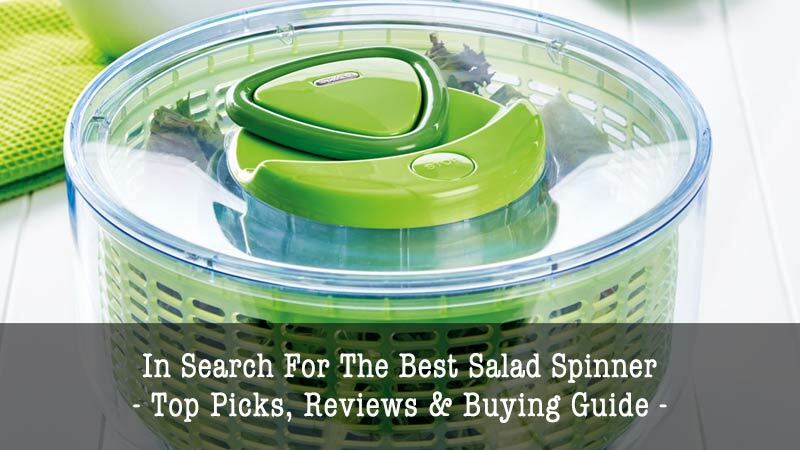 What the Best Features to Look in a Salad Spinner? What are you looking for in your salad spinners? You might want something that will do a good job of draining excess water from your greens and vegetables. Maybe, you want something that will be easy to clean when you are done using it. You also want something that won’t be so time-consuming to use. There are quite a few more features that you should look at when you are shopping around for a new salad spinner. Easy to Use: Dinner should not take so much math and science to make. Salad spinners should be easy that you will hard it almost hard to believe. After all, there are other things to work on in the kitchen. Also, you might be learning how to cook for the first time. Capacity: How much do you want your salad spinner to hold? Do you want a full meal of salad or do you just want a small one? How much salad is desire will depend on the size of salad spinner you get. 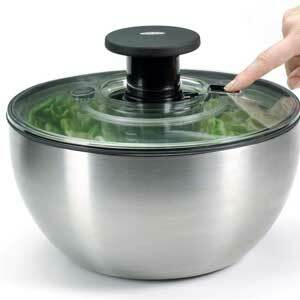 Spinning Mechanism: The whole point of a salad spinner is that is has to spin without any problems. No one wants a slow spinner that has to take forever to work. Tight-Fitting Lid: No one wants little bits of salad flying everywhere as they are spinning the greens inside. Having a lid that will close down properly will make life that much easier. 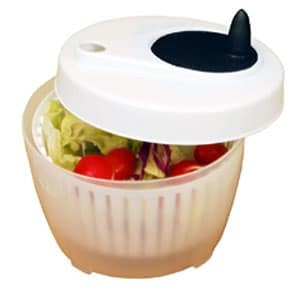 Locking Lid: Not having a mess in the kitchen cannot be stressed enough while working with a salad spinner. A tight-fitting lid that locks will be like a dream. BPA-Free Plastic: Plastics can be quite dangerous if you are not careful. Always check to see if there are BPA’s in your plastic salad spinners or not. Serving Bowl: Having a salad spinner is great, but it would be better if there were more than one uses for it as well. Plus, fewer dishes to keep up after cooking and eating. As stated above, people do not want a salad spinner that is going to break down on them after a number of uses. It would be a waste of money to try and buy another salad spinner to replace the one that broke down. This is not the only thing to look for. People also want something easy to use. These are good qualities to have in any kitchen item. What are some other qualities to look for in a salad spinner? Easy to Use: In this modern age, not many people have the time to cook a full meal in their kitchens. If a salad spinner requires you to sit down and read the manual for a full twenty minutes, it is not worth your money. Plus, it should not have so much effort to use. Spinning salad should not turn into a work out for your arms. Sturdy: You do not want your salad spinner to fall apart on you while you are using it. The last thing you need is to have mess that has to be cleaned up off the floor while you are drying your salad greens. It is not worth spending the money to replace your salad spinner. Look for features that will keep the salad spinner still and in place. The longer it lasts, the happier the customer will be. Many Uses: Having a salad spinner is good enough. But, wouldn’t it better if it can do more than one thing? Some salad spinners will give you a spinner, colander, and serving bowl all into one. It is all niffy, but that will make fewer dishes to wash dinner is finished. More uses and fewer things to clean. Budget: Try to look for something within the price range of $20 and $40. Before you go shopping for a salad spinner, check how much you have in your bank account. The last thing you need is to go over budget on a salad spinner that might not be good. User Reviews: What are other users saying about the salad spinner? Are they happy or are they warning you? Take the time to look at the rating and read the reviews. However, be careful after you read them. Sometimes, some reviewers can be trolls looking for attention. 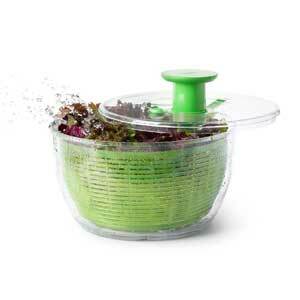 Easy to Clean: Your kitchen salad spinner should be easy to clean when you are done using them. Again, no one really has time to cook and clean in the kitchen. Look for salad spinners that are easy to take apart for cleaning. Everyone loves the OXO Good Green Grips Spinner. The critics can’t stop talking about it. I even have this salad spinner in my kitchen. After we took a look at it, it became easy to see why. With dimensions at 10.5 inches (ca. 27 cm) x 10.5 inches (ca. 27 cm) x 6 inches (ca. 15 cm), the OXO Good Green Grips Spinner is the right size for the causal salad dinner. The bowl holds up to 6.22 quarts (ca. 6 l). The basket holds up to 4.95 quarts (4.68 l). 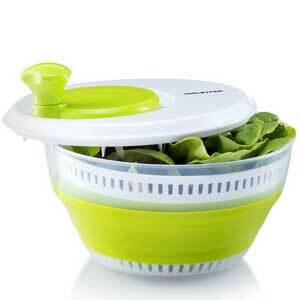 You will be happy to know that this salad spinner is also BPA-free and safe to use. The OXO Good Green Grips Spinner will make fixing salads so much easier. All you have to do is press the button on top and you are done. You just put your produce of choice inside, close the lid, and push the button on the top. It will save you so much time and it is easy that it is almost hard to believe. There are no complicated instructions to follow or extra parts to use. It is just preparing salad without all the headache and hair pulling. Your greens and fruit will be dry in seconds. Once you are done with drying the salad greens or produce, you can move onto cooking the rest of your meal. Worried about the basket slipping out of place when you use it? You do not have to fear. The OXO Good Green Grips Spinner is equipped with a wide non-slip base to keep it in place on the countertop. There is also a non-slip ring at the top to do the same. Not sure how to make it stop? You are covered there too. 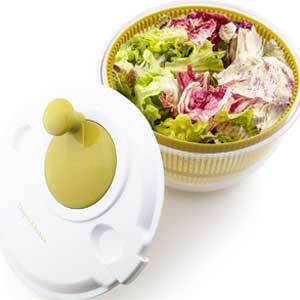 The top has a built-in brake button that stops your salad spinner so you can unload your salads green for your meal. The produce will come out looking perfect every time. Speaking of which, did you know that the OXO Good Green Grips Spinner can be used for other things too? The green basket in the OXO Good Green Grips Spinner is not just for drying your salad greens. You can take it out and use it as a colander. For example, you want to have some nice pasta to go with your salad. You can just take the basket out of the OXO Good Green Grips Spinner and set it in the sink. Then, pour your noodles in and watch the water drain. Shake out the excess water and your pasta is ready to eat. So easy and cuts down on how many dishes that you have to do during the clean-up. After all, why would you want to have extra dishes to wash when you would just have both a salad spinner and a colander in one? On top of that, the bowl can be used for serving your salad for the whole family. Your dry, healthy salad will look that much more appealing on your table when it is time to eat. But wait, there is more! After you are done using the salad spinner, it is time to clean it and put it away. The OXO Good Green Grips Spinner even makes that easy to do. You can just take the lid off and wash it. If you do not feel like washing it by hand, that is not a problem either. The OXO Good Grips Spinner is dishwasher safe. You will not have to worry about the damage that can be done to it or your dishwasher. After you clean the OXO Good Green Grips Spinner, it is time to put it away. The clear flat top makes it easier to stack and put away. This is good for if you do not enjoy fighting with clutter when digging around for your salad spinner in the cabinet. If you do not like the color green, you can get it in clear too. This salad spinner would make a good wedding gift. Looking for a salad spinner in your budget? The Utopia Kitchen Salad Spinner in the one for you. If you do not have that much money to throw away, take a look at this salad spinner. Think of this being in the pay range of about $11 to $20. But, something priced this low cannot be this good, can it? It holds up to 5.5 quarts (ca. 5 l) of fruits and vegetables. This one is one hand-operated. All you have to do is turn the crank and the spinner does the rest. You will not need a long handle to make it operate more smoothly. You will not have to use up so much effort for your meals. It is good for those who are not huge fans of electronic kitchen gadgets. People learning how to cook for the first time will enjoy this spinner too. 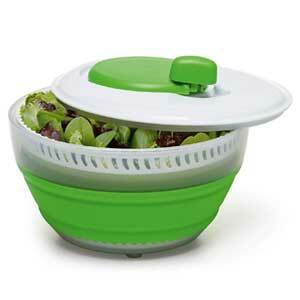 The Utopia Kitchen Salad Spinner will drain out all the water from your fruit and veggies without any problems. This is because of the hole to pour in the water from the tap. After use, you pour out the water through the spout with ease. When your produce comes out, they will look fresh and ready to eat. The Utopia Kitchen Salad Spinner can hold multiple units of cabbage, spinach, lettuce, and other vegetables without any problems. If you do not have time to wash them, you can simply cover them with the lid and storage your vegetables in the fridge. If you are health conscious, you will find this salad spinner perfect for you. The wide base will keep the spinner in place as you work. This salad spinner is made from high-quality plastic and easy to clean. You can take apart the colander and bowl for washing. If you do not want to wash it by hand, you can stick the spinner in the dishwasher. Just do not stick it in the microwave for any reason. This would make good gift for students going away to college. Cons: This salad spinner has to be cranked by hand, not microwave proof, and it might break after the first couple of uses. Why You Love it: The Excelsteel Cook Pro will be perfect for people with busy mornings on the go or people learning how to cook for the first time. This salad spinner is also small and easy to work with. Not every salad spinner has to be so big. Maybe there is not much space to put in your cabinets. Or, you might not have the time or appetite for a big salad. The Excelsteel Cook Pro is good for if you want a small salad. This salad spinner is 6.2 x 6.2 x 3.9 inches (ca. 10 cm) and holds up to 1.4 quarts (1.32 l) at a time. Busy people will find this a dream to have in their kitchens. They can just get their lunch ready for the morning or the night before with this salad spinner and not have to worry about for their day. My mother herself has this in her kitchen. Plus, the size is perfect to put away in your cabinets in your kitchen. Want to make sure that all the water is out of your fruit and vegetables? Worried about making a mess while you use the salad spinner? Not a problem! The Excelsteel Cook Pro has a handy clip lock straining lid that will keep your salad in place as you spin it. No more messes to worry about. After all, you do not have time to dry your fruits and vegetables and clean up after yourself. This salad spinner would be ideal for those who are learning how to cook for the first time. You can have fun with making little salads on the go. The colander inside can be used as a little strainer for your fruits and vegetables. Again, this is perfect for those who are too busy to make a big and full salad. This cannot be stressed enough. Did you know that you can use this as a salad bowl as well? Just take the colander out and put your salad in the bowl. You will not have to deal with not having enough space in your lunch box again. Speaking of which, the colander can be used to drain fruits and vegetables for cooking. This would be the perfect gift to send your child off to college with. 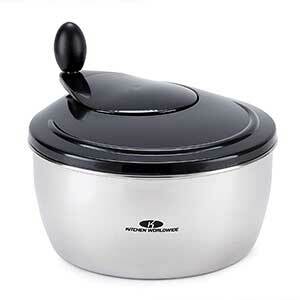 Pros: Small, good for those beginning to cook for the first time, easy to put away, the bowl and colander can be used separately, lid will keep in place while in use, and fully drains all the water perfectly. Cons: Not good for those who want a big salad and it might not work the way that you want it to. Sometimes, plastic will not cut it, especially when it is a special occasion. A salad spinner from the OXO company makes the list again. This one is made out of stainless steel. Like the OXO Good Green Grips Spinner, all you have to do is press the button on top and you are done. You just put your salad greens in, close the lid, and push the button on the top. No complicated instructions to follow or extra parts to use. Plus, the lid is clear, allowing you to be able to look inside. You can be able to catch if something should not be in the greens as you spin them. Worried about the basket slipping out of place when you use it? You do not have to fear. The OXO Steel Salad Spinner is equipped with a wide non-slip base to keep it in place on the countertop. There is also a non-slip ring to do the same. Not sure how to make it stop? You are covered there too. The top has a built-in brake button that stops your salad spinner so you can unload your salad green for your meal. The basket and bowl can be used separately. You can take it out and use it as a colander. Perfect for draining the water out of vegetables, fruits, herbs, and even pasta. So easy and cuts down on how many dishes that you have to do during the clean-up. So easy and cuts down on how many dishes that you have to do during the clean-up. You would just have one colander to wash instead of two. Why would you want to have extra dishes to wash when you would just have both a salad spinner and a colander in one? The basket itself can hold up to 6.34 quarts (ca. 6 l) at a time. On top of that, the bowl can be used for serving your salad for the whole family. The stainless can add a touch of class to fancier events such as a dinner party or a wedding anniversary. The bowl can hold up to 4.95 quarts (4.68 l). After you are done using the salad spinner, it is time to clean it and put it away. You can take the lid apart and clean it with ease. Afterwards, you can put it back together. Cleaning it is the easy part, but how will you put it away? Not to worry, the knob locks down, making storage a breeze. This will make the perfect wedding present. Here is another stainless steel beauty. The KitchenWorldwide is made of the best quality steel. This salad spinner was made with time and effort. They made this salad spinner to last you through the years. You will not have to worry about it breaking down on you. They designed it to be used every day. This salad spinner is not just used for draining your fruit and vegetables. It has a strong and durable plastic colander that can used to drain things like pasta and other vegetables. On top of that, there is a tight-fitting lid with a strong handle. The bowl measures 9.25 inches (ca. 23 cm) in diameter and 4.25 inches (ca. 11 cm) deep. The KitchenWorldwide is also safe to put in the dishwasher. This salad spinner is also really easy to use. Inside, it has an easy to use spin and stop mechanism that will do a good job with drying your fruits and vegetables. You do not have to deal with pull strings and buttons when you go to operate it. Customers will be happy to know that this salad spinner is BPA-free and safe to use. Worried about your counter tops? The KitchenWorldwide has a silicone non-skid base. You will not have a single scratch from it. Plus, you can use the food storage container to save for another day when you have leftovers. This salad spinner also comes with a three-year warranty if you order one right away. Not tempting enough for you? The storage container for salad greens or vegetables and a lettuce knife to make this deal the best. If you are not satisfied with the salad spinner, you can send it back and get your money back. This will be the perfect gift for Christmas. This salad spinner is both handy and stylish. The Gourmia GMS9100 will dry your lettuce, cabbage, spinach, carrots, fruits, and other foods in a snap. They will come out nice and crisp for snacking. There is plenty of space in the bowl for your salad. When you want to put it away, the makers made that so much easier to do. The beautiful green thermoplastic body is easy to fold up for easy storage. No more having to struggle with finding spaces to put your salad spinner in the cabinets. You do not have to worry about the Gourmia GMS9100 breaking down after the first few uses. The lid is ten inches long while the bowl is 4 3/4 inches (ca. 10 cm) when it is collapsed and six inches when it stands up. It is made of durable material that is EPA-free. Because of this, this salad spinner is environmental friendly. You can also wash this on the top rank of the dishwasher. The Gourmia GMS9100 is also so much easy to use. It is all in three easy to understand steps. All you have to do is rinse the vegetables, crank the handle, and remove the basket to toss your salad. That is all there is to it. The air tight lid cover has a comfortable crank style for the spinning. That is right. There is no button or electricity. You have to spin your fruit and vegetables by hand. But, it will be well worth it. People who are not comfortable handling electronic kitchen gadgets will fill at home with the Gourmia GMS9100. You can also use the giant bowl for serving your salad for the whole family. It will look that much more appealing on your table when it is time to eat because the nice green color. This will make the perfect housewarming gift. The Prepworks spinner is considered to be a customer favorite. After taking look at this salad spinner, it is easy to see why. Just like the Gourmia GMS9100, you can fold up this salad spinner and put away for storage. No more trying to find the right space for it in your cabinets. Both the internal and external baskets will collapse for the perfect storage space you need. This salad spinner is BPA-free and comes in full size. The base will not skid, keeping this salad spinner in place as you use it to dry your vegetables. The colander can be pulled out and used separately. When you are done, the outer bowl in 9.5 inches (ca. 24 cm) across, three inches tall collapsed, and six inches when tall. It can be used to serve your salad for the whole family. It can also hold up to three quarts. On top of that, the Prepworks spinner is dishwasher safe and easy to clean. If the salad spinner gets broken in any way, you do not need to try and repair it. Instead, you can email or call the company, and they will replace it without any questions. Plus, you will not have to pay a thing for your replacement. If you are left-handed, you can still use the Prepworks spinner. People with arthritis can use the Prepworks spinner without any problems. This would be a good gift to give for a housewarming party.